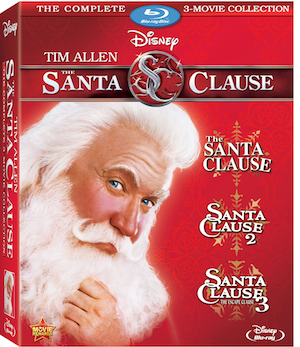 Just released on Blu-Ray DVD in a 3 Movie Collection Box Set including all 3 Tim Allen Santa Clause movies. Make this a must have addition to your DVD collection this season as the entire family will laugh and get into the holiday Santa spirit with the Santa Clause Movies. Halloween has passed and we are now moving onto Christmas full speed ahead. With kids who are 4 and 7, I’m ready to embrace EVERYTHING Christmas so we can savor every moment of the magic for the next 7 weeks. Today, we watched Santa Clause on Blu-Ray for the very first time as a family. I’ve seen the movies before, but Kenzie and Kyle have never seen them. As I anticipated the kids thought that Santa Clause was the best movie and they were totally into it as Tim Allen metamorphizes into Santa – gaining weight, growing a beard and craving Chocolate Chip cookies. Have three times the fun as you celebrate the season with the complete Santa Clause trilogy – now available for the first time on Blu-ray in one spectacular box set! Superstar comedian Tim Allen delivers the perfect gift as he stars as the big man, himself, in three warm and wonderful movies about discovering the truemagic of Christmas. See how it all began with Disney’s original classic, and hop on Santa’s sleigh for an exciting ride filled with belly laughs and family fun. Christmas gets a little nuttier when Scott Calvin unknowingly inherits the role of the legendary St. Nick. His ordinary life snowballs into a hysterical series of outrageous events as he fills out his Santa suit, meets the future Mrs. Claus and faces his ultimate test against the mischievous Jack Frost. With a blizzard of bonus features and three magical movies, this three-disc box set is hours of holiday entertainment your whole family will enjoy again and again. The Santa Clause 3-Movie Collection includes “The Santa Clause” (first time on Blu-ray), “The Santa Clause 2” (10th Anniversary Edition, first time on Blu-ray) and “The Santa Clause 3: The Escape Clause” (Blu-ray). Disclosure: We received a sample of this box set DVD. As always all thoughts and opinions are our own.